The individual pursuit race at SESCA on Thursday evening was replaced by a Topper race coaching session led by Mike Steele. 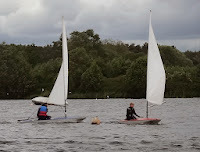 The four sailors present were put through their paces in light winds on an upwind-downwind course – refining running, beating and mark-rounding skills. All agreed that the session had been very worthwhile.